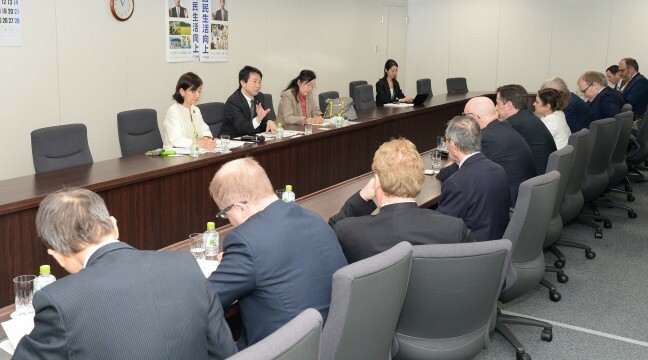 In the morning of April 4, DP President Kouhei Ohtsuka received a visit from a European Parliament Foreign Affairs Committee delegation at party headquarters. At the start of the meeting, Ohtsuka welcomed the delegation’s visit, and in response, delegation leader, the Chair of the European Parliament’s Foreign Affairs Committee, David McAllister, expressed his appreciation to the party leader on behalf of the delegation for agreeing to meet with them. Ohtsuka explained about the current situation in the Japanese Diet and within the DP itself, and the two sides discussed foreign affairs and security issues relating to the Japan-EU relationship, defence, and the issue of the Japanese Constitution. The meeting was also attended by DP National Campaign and Rallying Department Director-General Hiroe Makiyama.